A category page for scrambling and rock climbing courses, holidays and tours worldwide. 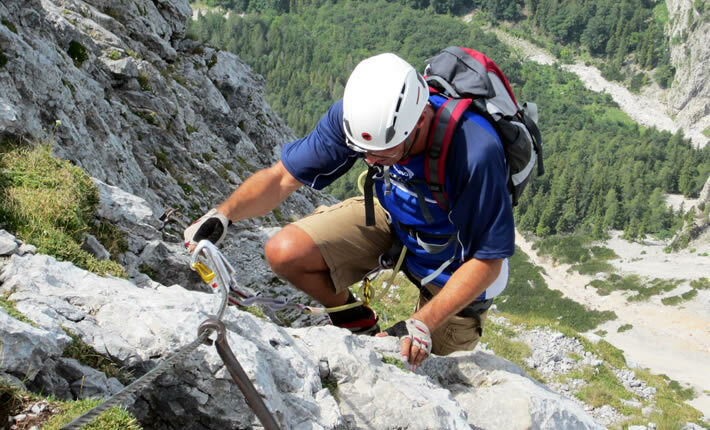 A select group of parcs in Europe (France, Italy, Austria & Spain) that make perfect bases for rock climbing holidays. There's great availability and keen pricing during the peak climbing months of May, June, Sept and Oct. Offering a wide range of comfortable, fully equipped accommodation, in superb locations. Rockbusters arrange sport climbing and bouldering holidays in Europe. Their main focus is their European Roadtrip, a 2-month climbing extravaganza which can also be taken in week-long blocks, they also run a number of sport climbing camps and a summer Czech sandstone course. Mountain challenges in the Southern Alps of New Zealand; offering mountaineering courses, guided mountain ascents and ski and snowboard touring. Aconcagua, Alps, Antarctica, Bolivia, South America and Patagonia expedition guides and mountain climbing outfitters. Ten day inclusive multi-activity and extreme sports adventure tours. Friendly, professional instruction in mountaineering, climbing and adventure activities in North Wales. Rock climbing weekends for beginners through advanced level, including outdoor yoga and climbing instruction. Climbing and outdoor pursuits in Sussex and the UK. Personalised rock climbing courses in Spain and winter mountaineering courses in Scotland. Professional instruction and guiding services, especially designed to cater for your particular needs and desires. Single and multi-day rock climbing courses for all abilities in spectacular surroundings. This Travel-Quest category covers both rock climbing and scrambling holidays and courses, the difference between the two loosely depends on the steepness of the ground and the difficulty of the route, but there is some overlap between hard scrambling and the easier rock climbs. Scrambling (sometimes referred to as 'Alpine scrambling') could be described easy rock climbing and covers the area between walking and climbing. It can be differentiated from walking by the use of hands for pulling up and balance. It's generally done without ropes and other technical equipment. Like rock climbing routes, scrambles are graded with a range that starts at Grade 1 ('Easy"), but which goes up to Grade 3 ('Difficult'), where some routes call for rock climbing skills and the security of a rope. Because it doesn't use the levels of protection used in rock climbing, scrambling at the higher grades can, in fact, be a more serious activity than low graded rock climbing. Scrambling becomes climbing as it get steeper and more difficult and once it involves the use of protection equipment like: ropes and harnesses, carabiners, belay and rappel devices (descenders), ascenders, slings, nuts etc. etc. – and where users wear rock shoes in warm conditions and climbing boots in the cold. There are a number of different styles and types of climbing and we're listing most of these of these within this one category, which may cover: trad (traditional) climbing, sport climbing, top-roped, soloing, free climbing, indoor climbing-wall courses etc. But we also have separate sections for bouldering, ice climbing, Via Ferratas and canyoning – accessed from the main mountain index here. Want to try out rock climbing before you go in a longer course? This is a special entry focusing on an excellent range of exhilarating one-day and gift climbing opportunities that range from indoor rock climbing courses at four UK locations, to full day rock climbing and abseiling experiences at the well known Harrison's Rocks crag in East Sussex. As well as this there are: kid's climbing and abseiling courses; ice climbing opportunities; coasteering, canyoning and gorge walking; mixed mountain multi-activity days; and high ropes adventures for all ages. The travel-quest rock scrambling and climbing holidays section is intended for listing holidays, vacations, breaks and multi-day courses where a major activity and focus is on rock climbing or scrambling using ropes and climbing protection and aids. Ths might also include free climbing, indoor climbing on climbing walls and un-protected scrambling. This is for holidays and courses where the focus is on technical rock climbing rather than full blown mountaineering, which has its own category. Ice climbing also has a dedicated category. To be listed in this section the activity must form a significant part of a holiday or residential cour.